[UPDATED BELOW 4/26/18] There has been a sudden increase in scammers pretending to be Advertising/Marketing companies and offering to pay people to wrap their cars with advertisements. Kind of like creating a rolling billboard. 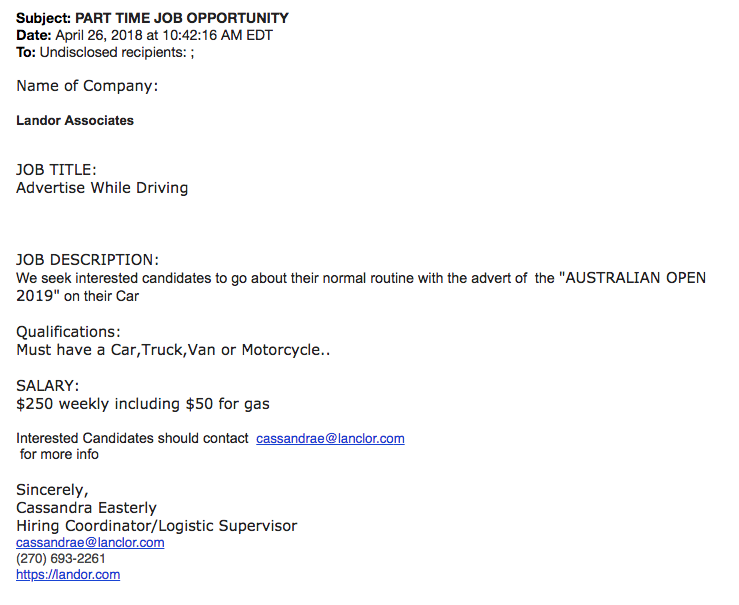 The scammers offer $300 or more per week and send a check for the first week’s pay plus extra money needed to send to the “company” who will be putting the ad onto the car. The victim is to deposit the check and wire/send the money to the company owner. Except the check is fake and bounces in about week or so. In the meantime the victim has sent his or her real hard-earned money to the scammer. NO ONE is going to send a large check to a stranger in advance without lots of guarantees and building a relationship, including voice/skype conversations, etc. This is nothing more than a variation of the same old advance-fee fake check scam. A colleague sent us this email that was forwarded to him today. Look very carefully at all the information in the email. Can you spot the clever discrepancy that many readers might overlook? The scammers who created this email used a clever trick that is easy to miss. The email claims to represent the firm Landor.com –> L-A-N-D-O-R . However, the contact email given to readers is for the domain Lanclor.com –> L-A-N-C-L-O-R.
We looked up both domains, landor.com and lanclor.com in a WHOIS tool. Landor.com is real and was registered in 1998! Lanclor.com was registered through a private proxy service as a website the day before this email was sent. What also makes this scam clever is the Landor.com is a real marketing firm and Landor.com is listed as the website at the bottom of the email. It pays to read carefully!